Happy Valentine's Day! Or as I like to call it, Happy Day Before Discount Candy Day! Yes, it's the pinnacle of Hallmark Holidays, and as we fill out eleventy million tiny cards for our kids to give out at school, all the while hoping they don't bring home some grotesque macaroni art in the shape of a heart that we'll have to display for months, but kind of hoping they do after all, because that's adorable, I present to you the stages of Valentine's Day through the ages. Because you and I both know we just want maybe a nice dinner that doesn't involve nuggets of any sort, and that discount candy, for obvious reasons. STAGE ONE: GRADE SCHOOL: Valentine's Day is serious business in grade school. What valentines will we receive, and much more importantly, how many? Will we get more than someone else? That is the most vital thing in those young lives. 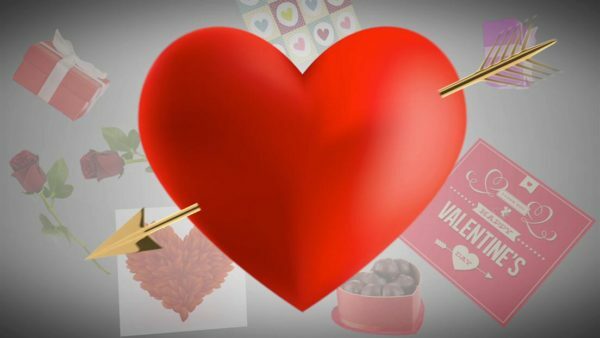 To get the MOST valentines, and also candy, because anything that involves amassing items and also amassing candy is a holiday that kids will celebrate the daylights out of. I have already been asked by the resident 8 year old if I got a lot of valentines in school, so she's obviously planning her hunting and gathering. Godspeed, 8 year old. May you get the BEST valentines, because it is very important indeed that one does. STAGE TWO: HIGH SCHOOL: No boyfriend/girlfriend? Catastrophic. Expect lots of pitiful looks, mournful music, and of course a heaping helping of "whatever, I don't care anyway, Valentine's Day is STUPID," all while trying not to burst into tears. And this is the better half of the deal! If a teenager is in a romance, how their partner treats Valentine's Day is a crisis. Do you get a rose? A rose is more important to a teenager than it is on The Bachelor. If not a rose, a stuffed animal? Candy? Something, anything at all MUST be presented on Valentine's Day or that relationship is as doomed as the Titanic. Valentine's Day, to a teenager with a partner, is ride or die time. And for the love of all that is holy, a carnation should NEVER take the place of a rose. You'd do better getting your teenage partner a Chia Pet than a carnation. Even teens know that carnations are garbage flowers. Smart kids. STAGE THREE: THE ROARING TWENTIES: In a relationship? Wine. Single? More wine. The 20s are easy. Everyone's broke, and wine is cheap. End of story. STAGE SIX: EMPTY NESTERS: The kids are out of the house, and you're back on your own. And the romance sparks re-ignite and lead to probably more Valentine's Day celebrations than you've had in the entirety of your lives. You know what each other likes and dislikes, and you get to do exactly what you both want to celebrate. Bring back the candlelit dinners, roses, and non-discount candy. Let the champagne flow! Just be careful, you crazy kids. You don't want to backtrack to Stage Five again if you know what I mean. So there you have it. Tell us in the comments: How are you spending Valentine's Day this year??? Organize the kitchen, just like that and a giveaway for our readers!